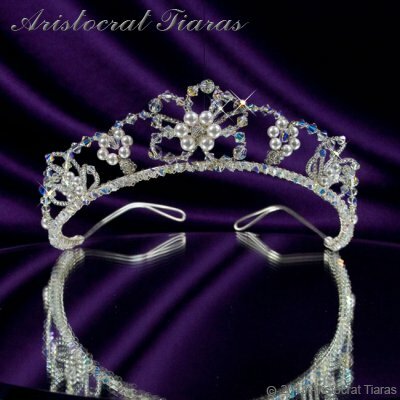 The Lady Isabella Swarovski tiara from Aristocrat Tiaras has a floral theme with a large 5 petal design in the front and two smaller 4 petal flowers on either side. The flowers are linked with arcs of sparkling crystal AB beads and interspersed with white pearl floral designs. The crystal bridal tiara emphasises nature and the natural beauty of the wearer. Lady Clara earrings and Lady Petunia necklace from our wedding jewellery collection are perfect accessory to compliment this crystal tiara on your special wedding day. All our crystal bridal tiaras are handmade in Herefordshire UK. Colours and designs may vary slightly from the picture. Ready to ship! This bridal tiara could be with you by 1pm Saturday 20th April (tomorrow).